The document used to update information about Items (e.g., technical descriptions and properties) on an existing Catalogue. 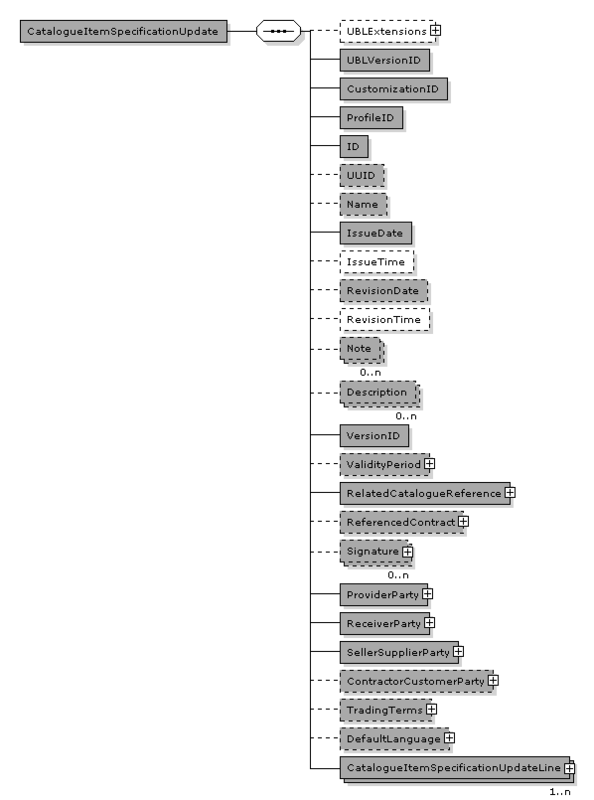 The earliest version of the UBL 2 schema for this document type that defines all of the elements that might be encountered in the current instance. Identifies a user-defined profile of the subset of UBL being used. An identifier for the Catalogue Revision assigned by the Seller. A computer-generated universally unique identifier (UUID) for the Catalogue Revision instance. A name given to the Catalogue Revision. The date when the Catalogue Revision was issued. The time when the Catalogue Revision was issued. The date assigned by the Seller at which the Catalogue was revised. The time assigned by the Seller at which the Catalogue was revised. Free-form text applying to the Catalogue Revision. This element may contain notes or any other similar information that is not contained explicitly in another structure. A description of the Catalogue Revision. Indicates the current version of the Catalogue Revision. The period assigned by the Seller during which the information in the Catalogue Revision is effective. This may be given as start and end dates or a duration. Note that the ValidityPeriod specified on headerlevel of the CatalogueItemSpecificationUpdate will change the ValidityPeriod for the whole Catalogue. An association to the Catalogue containing the revised Items. An association to a framework agreement or contract. One or more signatures applied to the document. An association to the Catalogue Provider Party. An association to the Catalogue Receiver Party. The Seller Party responsible for the contract to which the Catalogue relates. The Customer Party responsible for the contract to which the Catalogue relates. Only used when different from ReceiverParty. Is default value for CatalogueLine if the party is not specified on the line. An association to trading terms. Note that the TradingTerms specified on headerlevel of the CatalogueItemSpecificationUpdate will change the TradingTerms for the whole Catalogue. Are the TradingTerms not specified here or in a contract, the TradingTerms on the Order are applicable. The default language for the item specifications. An association to one or more Catalogue Item Specification Update Lines.